Indium oxide (In2O3) nanocrystals (NCs) have been obtained via atmospheric pressure, chemical vapour deposition (APCVD) on Si(111) via the direct oxidation of In with Ar:10% O2at 1000 °C but also at temperatures as low as 500 °C by the sublimation of ammonium chloride (NH4Cl) which is incorporated into the In under a gas flow of nitrogen (N2). Similarly InN NCs have also been obtained using sublimation of NH4Cl in a gas flow of NH3. During oxidation of In under a flow of O2the transfer of In into the gas stream is inhibited by the formation of In2O3around the In powder which breaks up only at high temperatures, i.e.T > 900 °C, thereby releasing In into the gas stream which can then react with O2leading to a high yield formation of isolated 500 nm In2O3octahedrons but also chains of these nanostructures. No such NCs were obtained by direct oxidation forTG < 900 °C. The incorporation of NH4Cl in the In leads to the sublimation of NH4Cl into NH3and HCl at around 338 °C which in turn produces an efficient dispersion and transfer of the whole In into the gas stream of N2where it reacts with HCl forming primarily InCl. The latter adsorbs onto the Si(111) where it reacts with H2O and O2leading to the formation of In2O3nanopyramids on Si(111). The rest of the InCl is carried downstream, where it solidifies at lower temperatures, and rapidly breaks down into metallic In upon exposure to H2O in the air. Upon carrying out the reaction of In with NH4Cl at 600 °C under NH3as opposed to N2, we obtain InN nanoparticles on Si(111) with an average diameter of 300 nm. One of the fundamental building blocks necessary for the development of nanotechnology are semiconductor nanodots (NDs), nanocrystals (NCs) or nanoparticles (NPs) viz. quantum dots (QDs). These are completely quantised, zero dimensional (0D) semiconductors with discrete energy levels whose electronic and optoelectronic properties are size dependent. Semiconductor QDs have been traditionally obtained by strained layer growth using molecular beam epitaxy (MBE) or chemical vapour deposition (CVD) [1, 2]. However, during recent years NDs, NCs and NPs have also been obtained using complex chemical synthesis involving solid, liquid and gas reactions and a broad variety of methods including hydrothermal and colloidal synthesis. So far, NDs, NCs, NPs have been realised from group IV elemental semiconductors like Si [3, 4] and Ge  but also III-V and II-VI compound semiconductors like GaAs , InP [7, 8], InN  GaN , ZnS [11, 12], CdS  and oxides like ZnO [14–17], SnO2 and In2O3 [19–28]. Among the III-V’s, nitride (N) semiconductors are especially attractive due to the fact that their energy band gap can be adjusted over a very wide range e.g. between 0.7 eV for InN up to 3.4 eV in GaN by changing the composition of the ternary semiconductor In x Ga1−xN over 0 ≤ x ≤ 1. On the other hand, among the oxides, In2O3 is a very important wide-band gap semiconductor (EG = 3.55 eV) which is widely used for the fabrication of devices such as electro-optic modulators, solar cells, electro-chromic mirrors and sensors . To date In2O3 NCs have been obtained via CVD using In2O3:In in a flow of Ar:CH4 at 950 °C by Jia et al. or just Ar between 950 and 1300 °C by Cheng et al. and Guha et al. . Similarly, chains of In2O3 NCs have been obtained by direct oxidation of In which was heated to 900 °C . High yields are critical in order to successfully fabricate nano-devices and low temperatures desirable for compatibility with mainstream silicon processes but also those involving polymers. One of the shortcomings in the synthesis of In2O3 nanostructures obtained by CVD is the fact that until now high temperatures have been used. Low temperature synthesis of In2O3 NPs has been demonstrated via the sol–gel method by Zhou et al., which took, however, >100 h and involved annealing between 500 and 850 °C. In addition, a high yield-low temperature synthesis of single crystalline tin doped indium oxide octahedrons via a low temperature, catalyst-free process was also demonstrated by Wei et al., who obtained nanostructures as low as 450 °C using a solution of indium acetate and tin chloride. Therefore, there is active interest in the low temperature synthesis of In2O3 NCs and an active, growing interest in InN QDs which have been grown by MBE or metal organic CVD (MOCVD) predominantly on GaN, AlN, Al2O3. Very few investigations have been carried out on the synthesis of colloidal InN NPs  while recently indium oxynitride which can be thought of as an alloy between InN and In2O3 was investigated and proposed for optoelectronic device applications . In this work, we have investigated the synthesis of In2O3NCs by direct oxidation of In with O2in an atmospheric pressure (APCVD) reactor and the limitations that arise as a consequence of the direct oxidation process. We find that during direct oxidation of In by O2the transfer of In into the gas stream is inhibited by the formation of an In2O3shell around the In powder which melts at 157 °C. The In2O3shell breaks up only at high growth temperatures (TG) i.e.TG > 900 °C, thereby releasing In into the gas stream which in turn reacts with O2leading to the formation of a high yield of In2O3octahedrons with sizes of 500 nm but also chains of these nanostuctures. No such nanostructures were obtained by direct oxidation forT < 900 °C. We find that including NH4Cl into the In under a gas flow of N2leads to the sublimation of NH4Cl into NH3and HCl at around 338 °C which results into the complete transfer of the In precursor into the gas stream of N2where it reacts with HCl and forms InCl that adsorbs onto the Si(111) and reacts with H2O and O2forming In2O3nanopyramids at temperatures as low as 500 °C. Upon carrying out the reaction under NH3as opposed to N2we obtain InN nanoparticles with an average diameter of 300 nm. The low temperature growth of InN and In2O3NCs directly on Si(111) using a common type of reaction could be exploited for the synthesis of InN/In2O3hetero-nanostructures for a diverse range of applications such as solar cells, sensors, etc. The In-based nanostructures were grown using an APCVD reactor which consists of four mass flow controllers (MFC’s) and a horizontal quartz tube furnace, capable of reaching a maximum temperature of 1100 °C. More specifically, we usedn+Si(111) andn+Si(111) covered with a thin layer of Au that had a thickness of a few nm’s. The Si(111) samples had an area of ≈1 cm2and initially they were immersed in HF, rinsed in de-ionised water and dried with nitrogen prior to the deposition of the Au layer in order to remove the native oxide and surface contamination. The Au layer was deposited via sputtering at a rate of 0.1 nm/s using an Ar plasma under a pressure <10−4mBar. For the purpose of optical measurements all of the In-based NCs were grown directly on quartz. In the case of direct oxidation at high temperatures, fine In powder (Aldrich, Mesh-100, 99.99%) was weighed and loaded into a quartz boat together with a Au/Si(111) and plain Si(111) sample. The Au/Si(111) sample was positioned about 5 mm over the In and the Si(111) about 10 mm downstream from the In powder. Then the boat was loaded into the quartz tube reactor and positioned directly above the thermocouple used to measure the heater temperature at the centre of tube. After loading the boat at room temperature (RT), Ar (99.999%) was introduced at a flow rate of 500 standard cubic centimetres per minute (sccm) for 10 min, in order to purge the tube. Following this, the temperature was ramped to the desired growth temperature (TG) in a reduced Ar flow of 100 sccm. Upon reachingTGthe flow of Ar was reduced to 90 sccm and O2introduced at a flow of 10 sccm for another 60 min after which the O2flow was cut off and the quartz tube was allowed to cool down over at least 60 min in an inert gas flow of Ar, 100 sccm. The sample was removed only when the temperature was lower than 100 °C. For the synthesis of In2O3 NCs at low temperatures, an equimolar mixture of In powder (Aldrich, Mesh-100, 99.99%) and NH4Cl (99%, VWR) was prepared and loaded in the centre of the quartz boat. A Au/Si(111) sample was positioned over the mixture of In and NH4Cl and a Si(111) sample without Au downstream from the mixture as described above. After loading the boat at room temperature (RT), nitrogen N2 (99.999%) was introduced at a flow rate of 500 sccm for 15 min in order to purge the tube. Following this, the temperature was ramped to the desired growth temperature (TG) in a N2 flow of 100 sccm’s. Upon reaching TG the flow of N2 was maintained at 100 sccm for a further 60 min after which the quartz tube was allowed to cool down over at least 60 min. Finally the InN NCs were obtained by using an equimolar mixture of In:NH4Cl and exactly the same growth conditions that led to the formation of InN nanowires by direct nitridation of In at 600 °C under a gas flow of 250 sccm NH3 which is described in detail elsewhere . The morphology of the nanostructures were examined with a TESCAN scanning electron microscope (SEM) and the crystal structure and phase purity of the nanostructures were investigated using a SHIMADZU, XRD-6000, X-ray diffractometer and Cu, Ka source. A scan of θ–2θ in the range between 10° and 80° was performed for the nanostructures grown under different conditions. For the XRD we used Al and stainless steel (Fe3C) holders to place the samples on the goniometer. In some of the XRD patterns the characteristic peaks of the holder material were detected and identified. Finally, optical spectroscopy was carried out using a standard spectrophotometer UV/V (Perkin Elmer Lambda 950) in the reflection mode at near normal incident to minimise scattering effects from the sample. In the case of direct oxidation of In with O2we observed the formation of In2O3NCs only forTG ≥ 900 °C and a typical SEM image of In2O3NCs grown atTG = 1000 °C is shown in Fig. 1a. Following the reaction we found that the In powder had expanded significantly into a porous like solid which disintegrated easily into a powder while a bright yellow dust corresponding to the In2O3NCs was found on the Si(111) but also in plentiful supply on the sides of the quartz tube. The In2O3NCs are octahedrons and had the tendency to form large dendrites consisting of In2O3NC chains as shown in Fig. 1b and c, respectively. The small In2O3NCs have a diameter of ≈500 nm, while the sizes of the larger octahedrons are almost ≈2500 nm. The surface density of the In2O3NCs across the surface of the Si(111) was very uniform and the density of the dendrites was dependent on the amount of In and the distance of the silicon from the In. 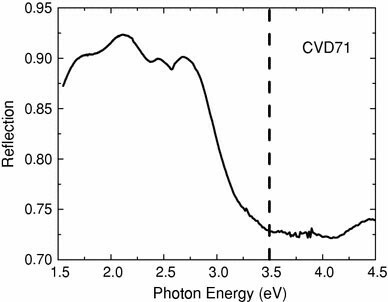 The In2O3NCs grown atTG = 1000 °C on silicon exhibited clear peaks in the X-ray diffraction spectra shown in Fig. 2and have a cubic structure, while the optical bandgap is near 3.5 eV as determined from the reflection spectrum shown in Fig. 3. As already stated above, no nanostructures were obtained for TG < 900 °C in the presence of O2 and the In powder which melts at 157 °C forms a well-defined sphere in the quartz boat found after each growth run. The surface of the In had a grey, non-reflective appearance as opposed to the highly reflective surface of In which we always obtained during the growth of InN from In and NH3. In contrast to the above findings, the reaction of In and NH4Cl occurred efficiently even at temperatures as low as 400 °C, since no trace of the In:NH4Cl mixture whatsoever was found in the boat after removing the latter from the quartz tube. In addition, a dark yellow powder was always found near the cool end of the reactor which rapidly turned into metallic grey upon exposure to the ambient air. A typical SEM image of In2O3NCs obtained on Si(111) at 600 °C after the reaction of In with NH4Cl under N2is shown in Fig. 4a. Larger In2O3NCs were obtained atTG = 500 °C, as shown in Fig. 4b. Interestingly, no nano-pyramids were obtained on the Si(111) that was covered with a few nm’s of Au and positioned directly over the In:NH4Cl mixture. In the case of In, we find that incorporation of NH4Cl leads to the complete transfer of the solids of In and NH4Cl into the gas stream of N2. Indium has a low melting point of 156 °C and once molten it forms a sphere whose size depends on the initial amount of powder. The complete elimination of the In and NH4Cl is a direct consequence of the sublimation of the NH4Cl into NH3 and HCl which occurs at 338 °C. According to Chaiken et al., the sublimation rate of NH4Cl increases by a factor of 104 when changing the temperature from T = 100–600 °C and the typical sublimation weight loss of NH4Cl is over 90% when heated for ≈60 min. Sublimation is endothermic and the temperature is expected to be reduced only by a few tens °C in the case of NH4Cl . A similar reaction involving spraying of InCl3. H2O in ethanol was recently employed for the deposition of a polycrystalline thin film of In2O3 on stripe-patterned Si at 280 °C . The In2O3 NCs have a stable, light yellow colour, even after exposure to the ambient air. However, most of the InCl is carried downstream as evidenced by the large amounts of dark yellow powder found only near the cool end of the reactor. Both InCl and InCl2 decompose into In and Cl when reacting with H2O and so lead to the separation of metallic indium. Therefore, the rapid change of the dark yellow powder to metallic grey upon exposure to the ambient air is attributed to the humidity of the air, i.e. H2O. It is important to point out that the In2O3 NCs were also obtained via the sublimation of NH4Cl in In under the presence of O2 for T < 900 °C. In contrast, no In2O3 NCs were obtained in the case of the oxidation of In alone by O2 for T < 900 °C. The formation of In2O3 pyramidal NCs on Si(111) was confirmed by the XRD spectrum shown in Fig. 2. 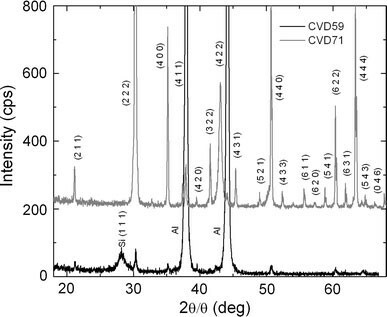 In both XRD spectra illustrated in Fig. 2, only the In2O3 reflections are observed ensuring the absence of a second phase. All In2O3 peaks in Fig. 2 correspond to the In2O3 peaks also observed by Du et al. who have grown In2O3 structures by dehydration of In(OH)3 after heat treatment at 500 °C for 4 h. The In2O3 peaks have higher intensities for growth temperatures above 600 °C. On the other hand, the sublimation of NH4Cl in the In under a gas flow of NH3 does not yield pyramidal NCs. 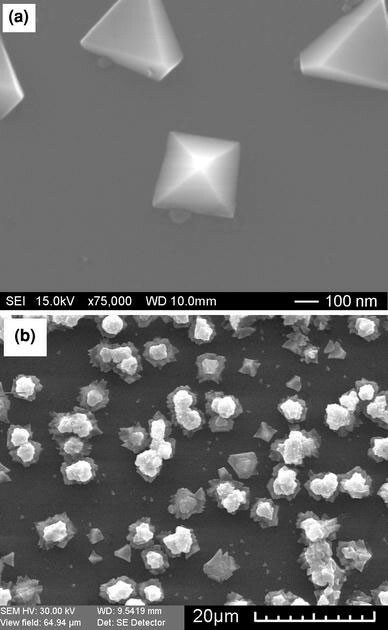 Upon carrying out the reaction of In with NH4Cl in a gas flow of 250 sccm of NH3 as opposed to N2 at 600 °C  we obtained single phase, hexagonal structured InN NPs with an average diameter of 300 nm as shown in Fig. 5b and confirmed by XRD shown in Fig. 5c where the (002), (101), (103) and (112) reflections of the InN, Si (111) and the stainless steel holder peaks are observed. In this case the InCl reacts with the NH3 giving InN similar to the recent investigation of Kumagai et al. on hydride vapour phase epitaxy of InN epitaxial layers via the reaction of InCl3 with NH3. These InN NCs are also very similar in size and morphology with those obtained by MOCVD on GaN . An interesting aspect of the In2O3NCs obtained from the reaction of In with NH4Cl is that they self-assemble into well-defined circles forT ≤ 600 °C, as shown in Fig. 6a and coalesce near the periphery leading to the formation of μm size, flower-like structures, as shown in Fig. 6b atT = 500 °C resembling a wreath. Upon reducing the temperature to 400 °C we do not find anymore isolated In2O3NCs but only μm size flower-like structures which now fill the wreaths, as shown in Fig. 6c. This type of self-assembly was not observed for the In2O3NCs grown by direct oxidation of In with O2atT > 900 °C which aggregate into dendrites that consist of NC-chains. A possible explanation for this type of self-assembly is wetting of the Si(111) surface by In. The wetting is not uniform across the sample but instead the In forms wet circular regions on the Si(111) surface which tend to expand as the growth proceeds thereby leading to the coalescence of the NCs and the formation of the wreath-like structures shown in Fig. 6a–d. These wreath-like structures become larger when decreasing the temperature and the individual flower-like structures may grow up to 20 μm, Fig. 6d. We have investigated the synthesis of In2O3NCs by direct oxidation of In with O2and also by the incorporation of NH4Cl in the In under N2. The reaction of In and NH4Cl yields InN NCs using NH3. The synthesis of In2O3NCs by direct oxidation of In with O2is limited by the formation of an oxide shell surrounding the In which can be eliminated only atTG > 900 °C as a consequence of the expanding melt therefore allowing an efficient transfer of In into the main gas stream. AtTG > 1000 °C we obtain 500 nm size In2O3NCs but also dendrite structures consisting of NC chains. The high temperature requirement can be alleviated by the addition of NH4Cl into the In which breaks down into NH3and HCl by sublimation thus resulting into the complete transfer of the In into the gas stream and the formation of InCl which reacts with H2O and O2. In this way we obtained In2O3NCs at temperatures as low as 500 °C under N2but also InN by simply changing from N2to NH3. This method is potentially interesting for the synthesis of narrow and wide-band gap InN and In2O3NCs at low temperatures but also for nano-engineering of heterostructures and the fabrication of novel devices such as third generation solar cells.